In this detailed and eminently educational eBook, you will learn why data storage is becoming more complex. 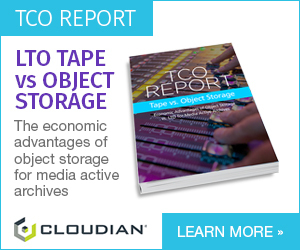 You’ll grasp concepts such as object-storage and understand the meaning of unstructured data. Fathom why we are moving from flat file systems and how scalability can be achieved. Data is now arguably the most important aspect of our lives. Media facilities are exponentially generating data at unprecedented rates and we are becoming more reliable on storage than ever. Diverse, unstructured data sets continue to be distributed over cloud, on-prem, and edge-storage, and the interconnectivity of these devices is becoming more and more important to us. Download this meticulously compiled eBook now to understand the challenges ahead, and more importantly, the solutions that are available today. Discover how to future proof your facility and take full advantage of modern advanced scalable storage systems for your broadcast facility.